It seemed to be a name that suited. Both my wife and I are in agreement, Aquarelle is the name of our boat that we bought last summer. It was launched into the cold Baltic yesterday but the day was so sunny and perfect. A good sign for great sailing in 2018! Summer is coming soon, well I would at least like to think so. Looking forward to it when it does arrive. I am very happy with these wide scene formats I have been painting recently but they do present a problem, they look very small when I present them on Facebook or even here on my website. It’s a pity because they look real good framed and hanging on the wall. I am considering just showing a 4 by 3 version, cropping the watercolour to suit social media. Instagram is even worse, it is square! Click image below to see larger version. 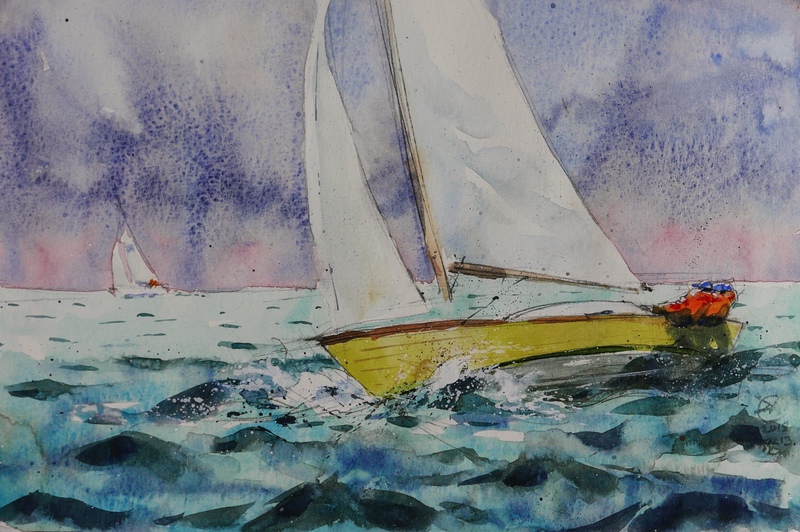 People here in Stockholm like my paintings of sailing boats in the archipelago, they sell very easily so I’d be stupid not to continue creating them. This painting is interesting as it is in a wide format which suits paintings of the great outdoors a lot. I painted this watercolour in the beginning of November last year. I never took a decent picture of it as it was so dark back then and I was in rush to get it framed for the exhibition I had in early December. It was sold and I miss it really, I didn’t have time to enjoy it. They are like little children, very dear to the heart at least the ones that shine. I’ll just have to paint a replacement so I can forget it, larger maybe this time. 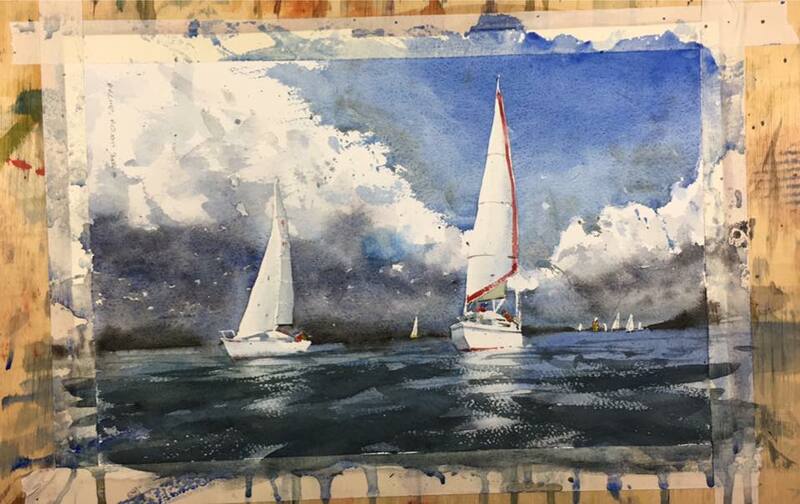 The watercolour was painted after my course with Chien Chung-Wei, it shows I think, my brushwork is more daring and the composition is well thought through. Please click the image here if you would like to see a larger version of the painting.